At one point, it sounded like something out of a sci-fi movie: push a button and “print” a sofa for your home in minutes. Thanks to new technology in the field of additive manufacturing, or 3D printing, we’re not too far from that reality. With 3D printing, manufacturers use advanced machines to “print” either entire pieces or parts for pieces. Usually, extremely hard plastic or silicone builds up the piece, but some makers are branching out to metals and even wood. 3D printing can be much faster, and much more affordable, than traditional furniture making methods. These machines work more quickly than people and can produce furniture around the clock. And the materials they use are readily available, cheap, and durable. Additive manufacturing also allows manufacturers to produce pieces that would be extremely difficult or even impossible with traditional furniture-making methods: 3D printers can make full use of 3D space and aren’t hindered by the effects of gravity. Furniture makers are no longer bound by the limitations of furniture-making methods like inject-molding or routing. They are free to make incredibly complex pieces that are beautiful in their intricacy. The latest designs from the world’s top brands are both functional and pleasing to the eye. And, combined with traditionally-manufactured or natural pieces, such as fabric, cushions, wood legs and platforms, and more, these 3D pieces are becoming a comfortable staple in homes and offices everywhere. Most 3D printed pieces have an organic, natural look to them; some go as far as to appear “futuristic.” Manufacturers take advantage of these design features to minimize the amount of plastic used in the piece, which lessens the weight. Many of these pieces, especially those with an emphasis on natural forms, would be right at home in a mid-century modern space. Those with eclectic tastes shouldn’t have any problem incorporating them, either. For more traditional spaces, you will need to add additional pieces made from similar textures and colors, to further incorporate your 3D printed piece. If your space has modern feel, try to choose pieces in the same color scheme as your home. Softer, ombre or pastel pieces will look jarring in a space that is clean and minimalist. With further advances happening in 3D printing everyday, we might not be too far away from printing a sofa in our living room at the press of a button. This month, I am celebrating forty years in the industry. I thought that this anniversary provided a great opportunity to reflect on my time in the business. A lot has changed in the past four decades – both for me and the industry. An article from 1981 featuring a young me. 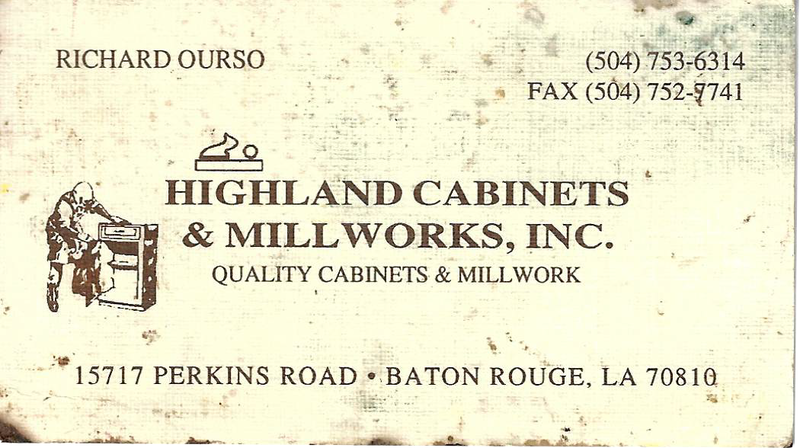 I started working in a cabinet shop in September of 1978 – Highland Construction & Manufacturing. I started out as a floor sweeper. Within two years, I was promoted to a full-time cabinet maker. I quickly learned the trade. At the time, stain-grade wood was really popular. Sometimes, I miss the natural depth of stained wood. Today, painted woods – painted cabinets – are much more common. People today prefer the brightness of painted wood. My business card with Highland Cabinets. We’re also entering an era of simplicity. 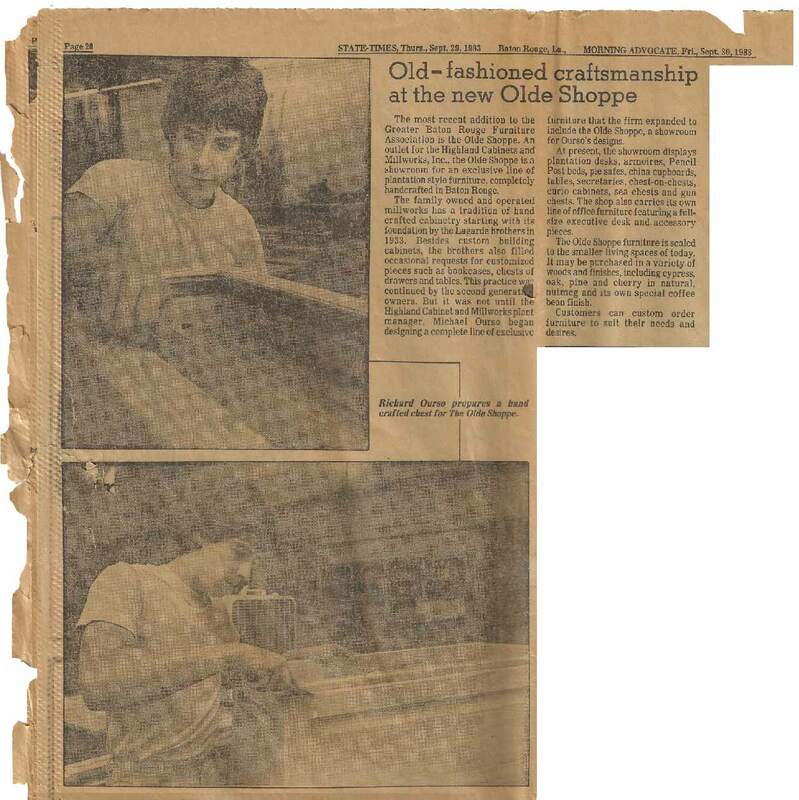 Corbels, pilasters, and heavy trim and carvings were in fashion when I first started at the cabinet shop. Now, most of my clients prefer a simpler, more minimalistic design. To a certain degree, this change is a good thing. It was very easy for designers to overdo intricate millwork, ending up with a design that was gaudy and ugly. Minimalist looks are hard to mess up. Mid-century-inspired designs are popular with today’s clients. And 7-foot tall cabinets used to be it. Can you imagine? Now, so many homes have 8-, 9-, even 10-foot tall ceilings, with tall cabinets to match. After working as cabinetmaker, I started thinking about the next stage in my career. I enjoyed working with my hands and being creative. I also found that I had a knack for looking at a piece of wood and seeing its entire life – what it would like in a cabinet, what the cabinet would look like in a home, how it would function in a kitchen while the owners were cooking. This led me to seriously consider design, and I started taking design jobs part-time. Two business cards I used when Richard Ourso Kitchen Designs had just opened. 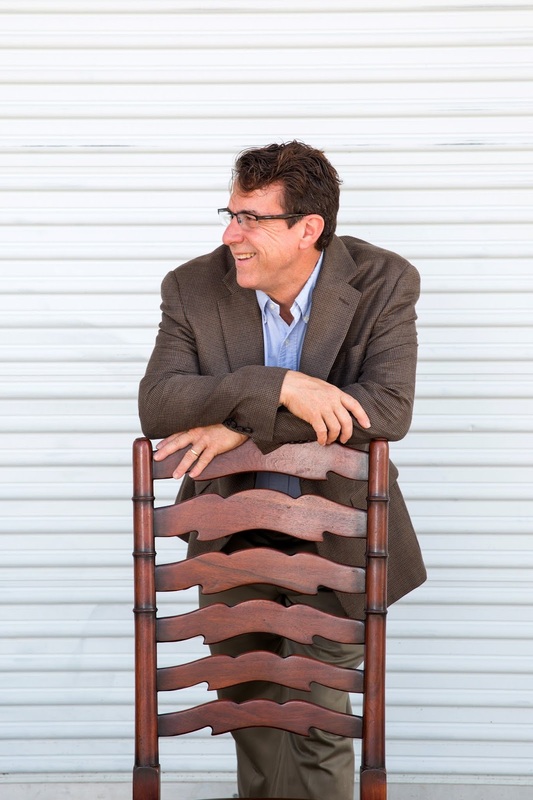 I eventually opened up my first business, Richard Ourso Kitchen Design. I liked kitchen design because it allowed me to focus on the details of the space. Whole-home designers and architects simply don’t have the time to look at the particulars of a space and make it function. I wanted to focus on how the space flowed – something that is still important in my designs today. That’s another that has changed – there are more specialty designers than there were four decades ago. 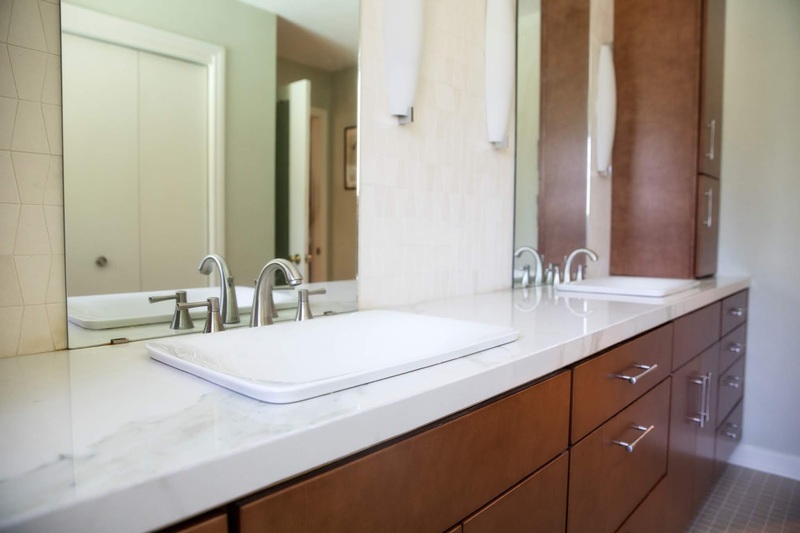 When I started my design firm, there were hardly any kitchen and bath designers in the area. Even my second job – a new build – was a whole home design. 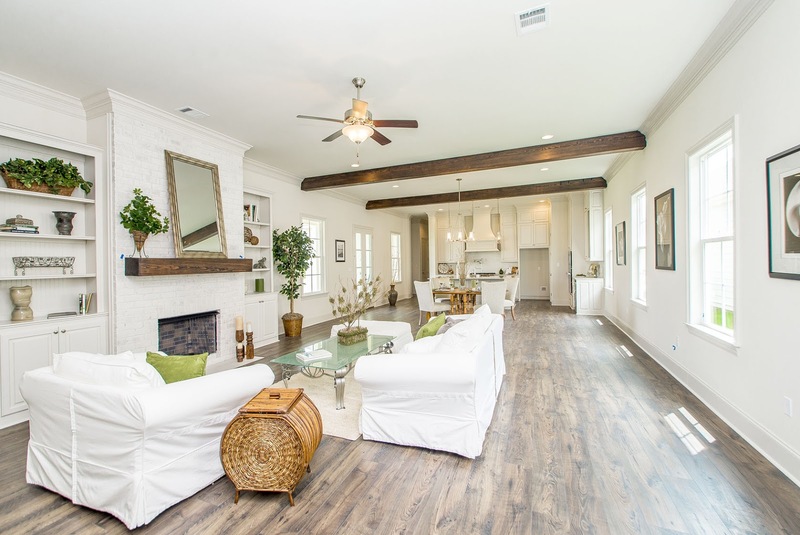 It took a while for the Baton Rouge market to adjust to kitchen and bath designers. My first beam job after opening The Olde Mill. Over the years, tastes have changed. Baton Rouge used to be a very traditional market. In the last 8 – 10 years, I’ve noticed more and more homeowners requesting transitional designs. These new spaces lack the bulkiness and gaudiness of what was popular in the 1980s and 1990s. And galley kitchens used to be the most requested kitchen layout. Today’s clients would find this design inefficient. 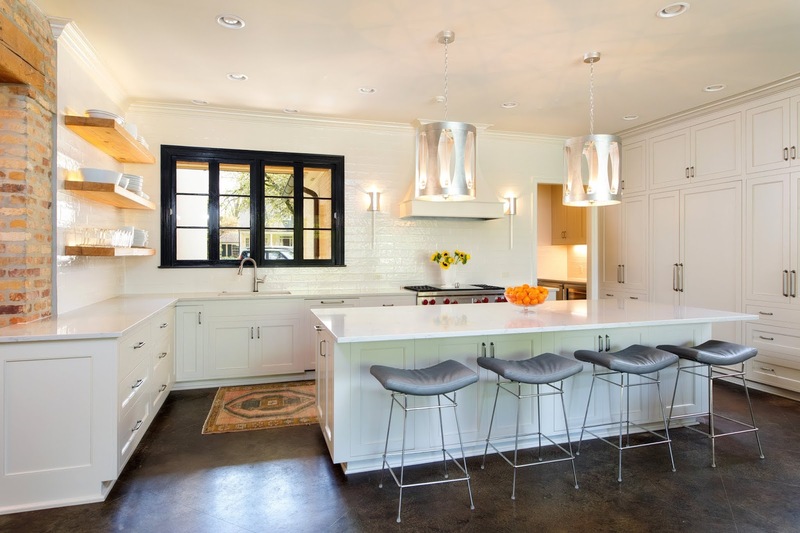 L- and U-shaped kitchens with large center islands are now the norm. An L-shaped kitchen with island I designed recently for a local home. As a whole, home design used to be much more segmented. You had a dining room and a kitchen as completely separate spaces. Most modern clients want a home with an open floorplan. I myself prefer the more open concept because it allows the space to flow with the family. Both my Ourso Designs and my manufacturing company, The Olde Mill, continue to grow and change. I’m excited to see what the next few years have to offer. The dining table is arguably the most important piece of furniture in a home. It’s where your family gathers for dinner, where breakfast is served. It’s where kids do homework or Mom and Dad catch up on work they didn’t finish at the office. Friends and family gather around it for Thanksgiving dinner or a party on the weekend. A lot happens on single piece of furniture. The importance of the dining table demands a certain amount of gravitas in it’s selection. 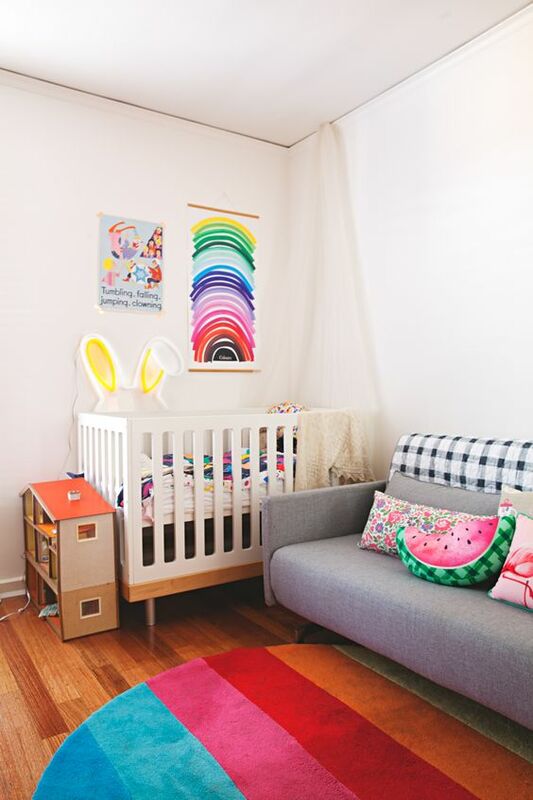 A simple mistake – too large of a table for the room, for instance – can have a rippling effect on your family’s home life. Every family is different. Some families eat every meal at the dining table. Some only only use it for more formal occasions, such as holiday dinners or extravagant parties. And the use should dictate the style of dining table. You want to get the most use possible out of your dining table. Pick something that meets the needs of you and your family. If you eat in often, pick a table that will sit the whole family, plus a few extra. If you rarely sit down together, get something cozier. Of course, you can’t fit a conference-length table in a cozy, 8′ x 10′ dining space. You know that. But there are also some other hard rules when it comes to considering your table’s fit. When shopping, don’t just think about the footprint of the table – think about the space the dining table AND guests will take up. You need at least 3 feet of clearance between the wall and the table on all sides. And don’t forget chairs. They contribute to the size of the table. Your guests will more than likely sit with the seat partially, if not all the way, out from the table. That 3 feet of clearance will give you and guests plenty of room to move about the dining table. Really, the more space, the better. If you simply can’t give up that much space to your table, a pedestal table is the way to go. A single, center base leaves lots of room under the table for everyone’s legs. The two most common dining table shapes are rectangular and circular. Both shapes have their benefits, as well as drawbacks. Rectangular dining tables are the easiest to fit in a dining room, for one simple fact – most dining rooms are also rectangular. This also makes it easy to size the dining table. Most rectangular dining tables are between 36″ and 42″ across, which provides ample room for two place settings and a center piece. The length of the shouldn’t be more than 6 feet shorter than the length of the room. One major drawback of rectangular tables come with the corners. If space in the dining room is tight, it is difficult to navigate around the corners when the table is full. Also, no one wants to sit at a corner seat. If you’re planning on a smaller dining table, a circular or round table is preferred. It allows everyone at the table to see each other equally. There’s no yelled conversations down a long table like you see in movies. Of course, a round table offers less surface area for eating than a rectangular table with a similar footprint. When the table is crowded, this will limit both serving space and elbow room. You can find a compromise of the two shapes in the oval table. The oval table will give you a little more space to squeeze around in a rectangular dining room, since the corners are cut off. You can still get the length that you would want with a rectangular table, but without sacrificing the equanimity of the round table. Opulent. Luxurious. Plush. There are many words to describe the Chesterfield, the majestic tufted sofa that is both timeless-ly trendy and undeniably comfortable. The first Chesterfield sofa was commissioned by one Lord Phillip Stanhope, the 4th Earl of Chesterfield and mid-1700s style maven; he requested a couch that looked good AND didn’t wrinkle his trouser pants. Emerging techniques in leather smithing created a soft, supple leather, that could be molded, tucked, and pinched into intricate designs. This made the fabric an obvious choice for Stanhope’s sofa. Like any good design, the Chesterfield’s popularity has had its peaks and valleys – as of this moment, it’s popularity is on the rise. You have a great opportunity to get ahead of the curve! If you’re thinking about adding one of these posh pieces to your own design, fabric and color are key. 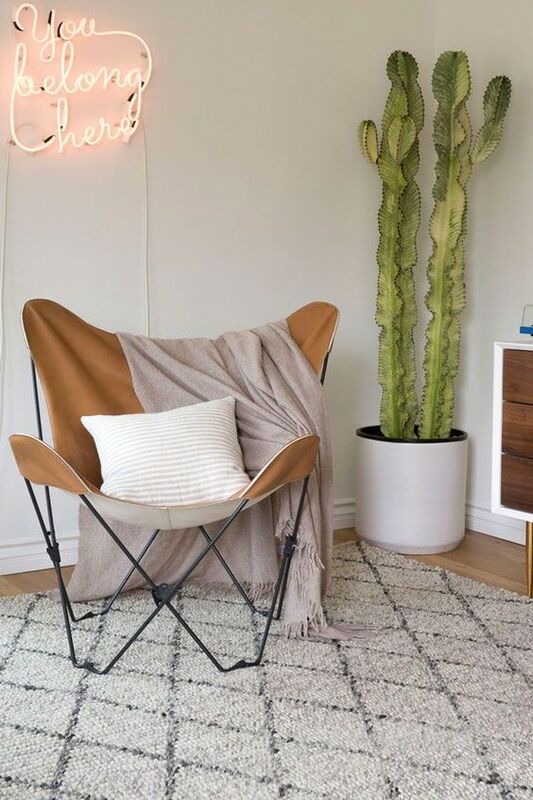 Leather is always an option, but a huge range of fabrics – linen, canvas, suede – as well as a rainbow of colors make this great design more versatile than ever. Pink velvet will take this Old World classic to a modern and fun place. The sofa is the most traditional offering, but it is far from the only one. Many designers today are selling Chesterfield chairs and loungers. 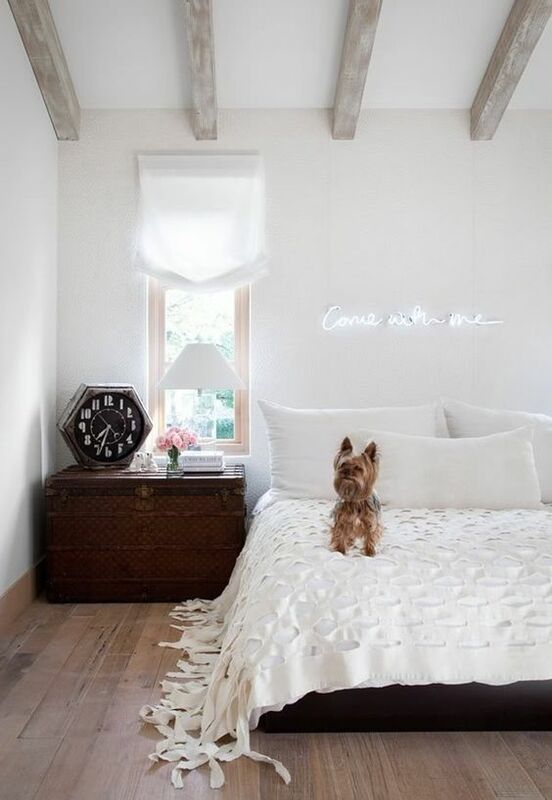 This is a great way to incorporate the look in an existing room, without drastically changing the style. Tufted ottomans and headboards also offer a way to get the Chesterfield feel. There’s a whole world of possibilities out there and nothing to hold your style back! Prefinished cabinets used in a recent job. See more pictures here. 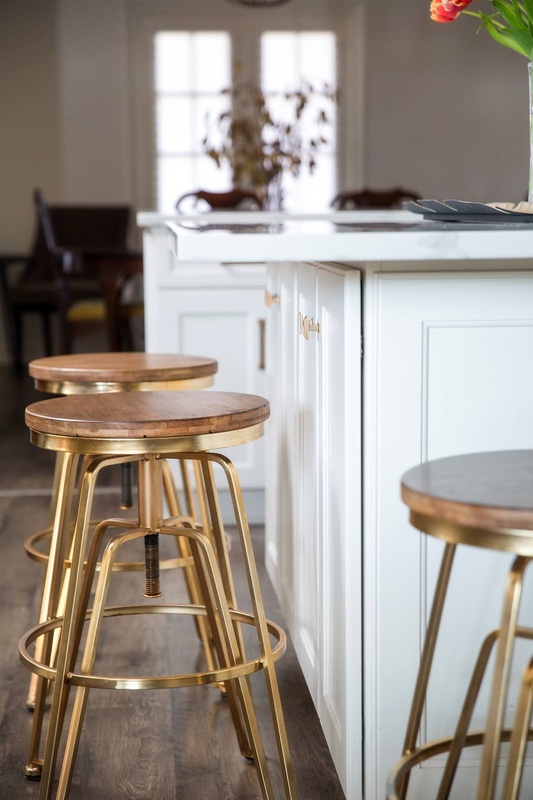 After the flood two years ago, prefinished cabinets were almost a necessity in the Baton Rouge area. Many people simply did not have the time to wait for custom cabinets to be created for their homes. The disaster gave locals a new respect for prefinished cabinets. 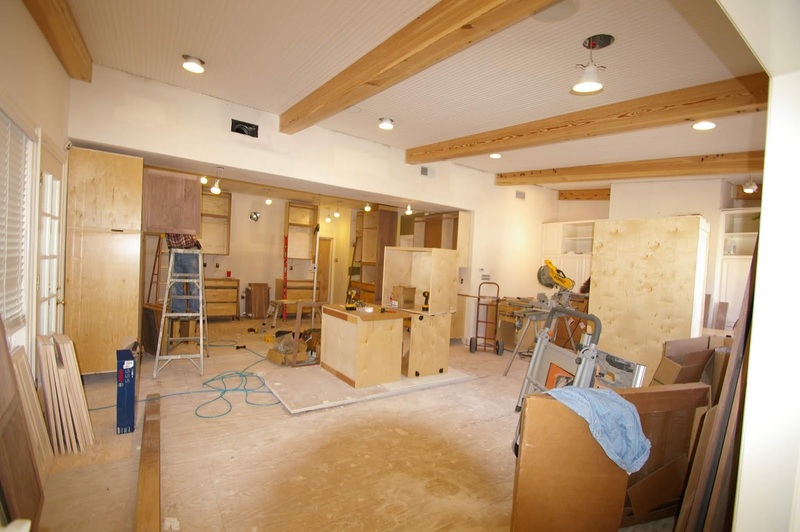 For a long time, pre-finished cabinets have had a bad rap. “Particle board” construction has long scared away homeowners – as a material, it can be difficult to work with, and it does not always age well. But today’s prefinished cabinets are far more sophisticated, both in material and construction. New construction techniques mean they can be customized to a greater degree than ever before. These cabinets can be a welcome addition to your next project, if you know how to work with them. If you’re planning on using them in a job, there are a few things you should consider. 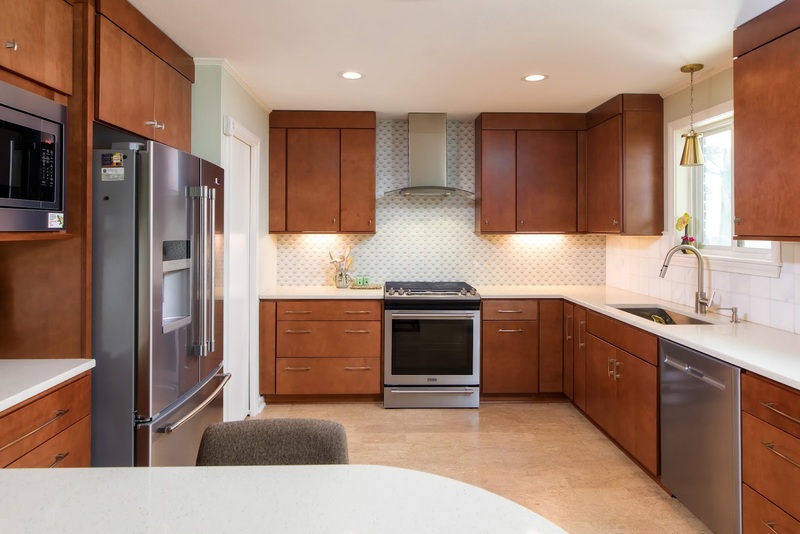 Prefinished cabinets used in recent mid-century modern remodel. See more pictures here. 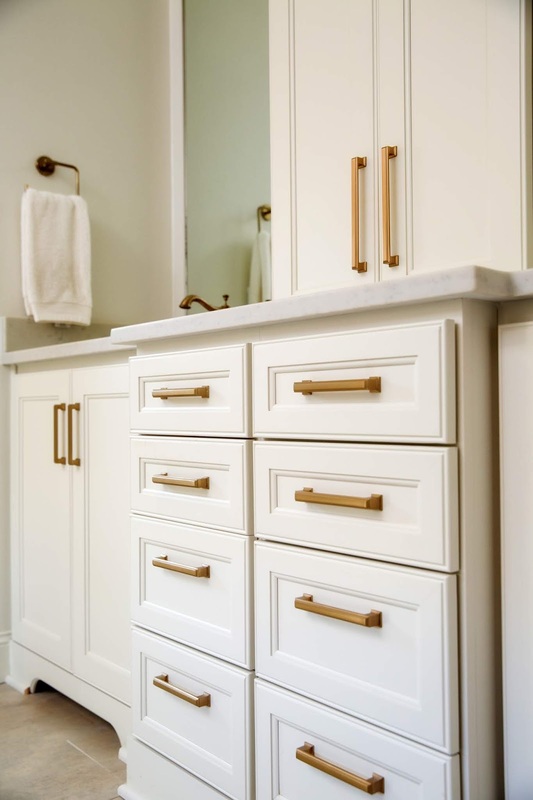 Prefinished cabinets used to remodel a bathroom. See more pictures here. Prefinished cabinets used to top off a bathroom remodel. See more pictures here. 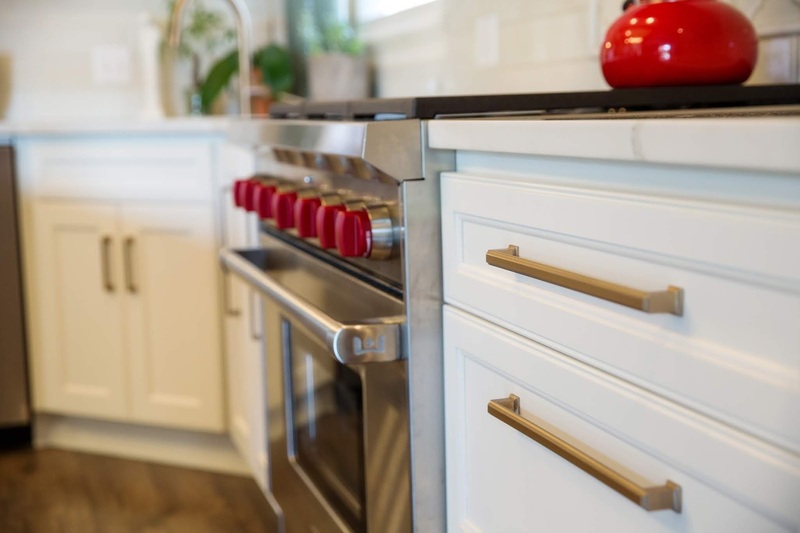 If you’re planning on incorporating prefinished cabinets into your next project, be sure to work with a reputable dealer. This will help you avoid getting products that are made from low-grade particle board or that have variances in hardware. 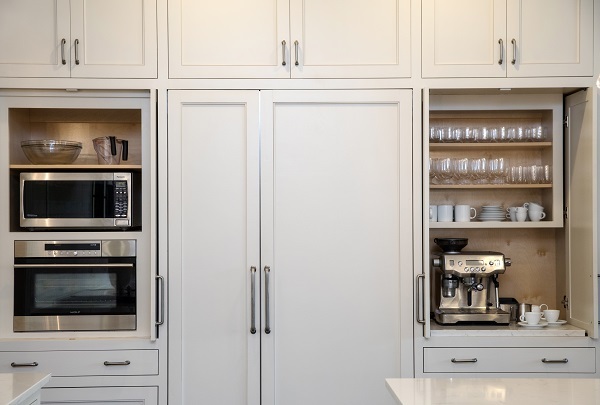 Look for the The Kitchen Cabinet Manufacturers Association, or KCMA, certification to ensure that your cabinet manufacturer is using high-quality materials. Pull-out drawers like these are just one of the many customizations that can be added to prefinished cabinets. See more pictures here. Some things, like inferior materials or hardware, can be avoided by working with the right company. 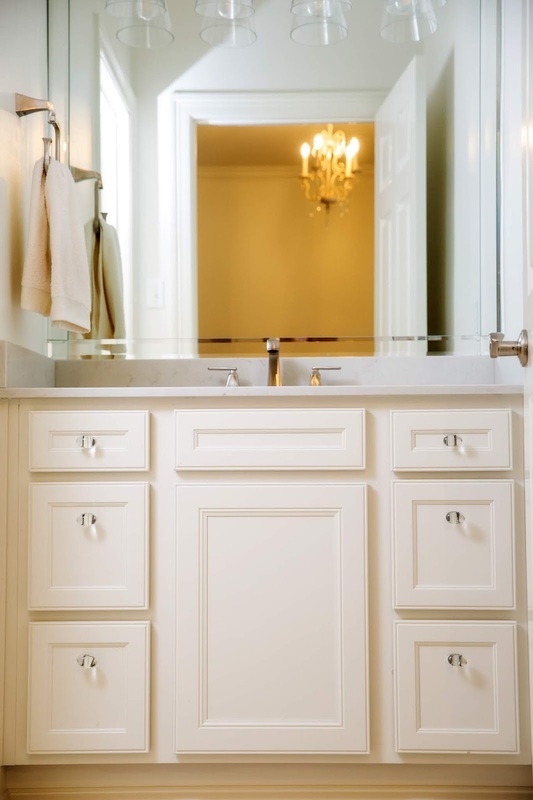 At Ourso Designs, we are a dealer for Wood-Mode, a high-end prefinished cabinet brand. 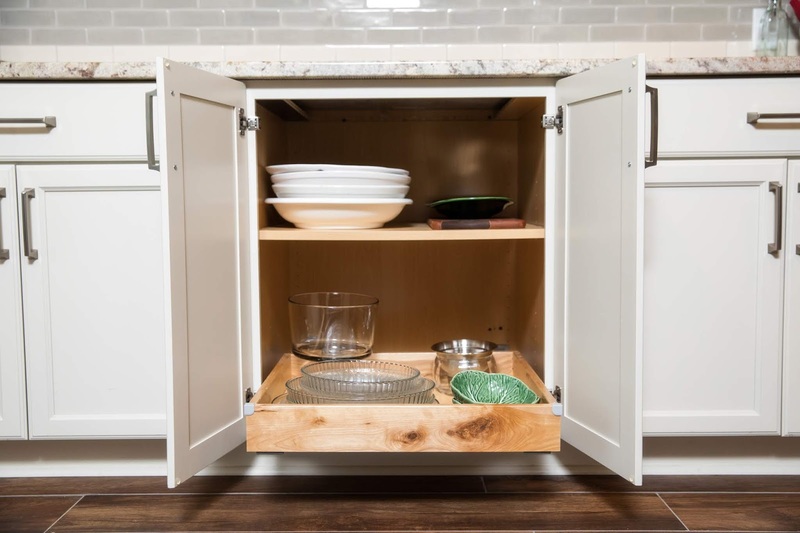 These cabinets aren’t made from poor particle board; the materials Wood-Mode uses are great, and their range of customizable features means that you can find something to suit any homeowner’s needs. Wood-Mode is one of the founders of the KCMA. I highly recommend working with them for your next project. This is not to say that we don’t use custom cabinets in our projects. We have a longstanding relationship with the team at Baton Rouge Custom Cabinets; I cannot recommend those guys enough. They do a great job, from choosing quality materials and hardware to installing at the jobsite. Custom cabinets can be the right choice for the job. Baton Rouge Custom Cabinets made these cabinets for a local kitchen we worked on. See more pictures here. It’s always a good idea to know your options, so that you and your client can make an informed decision for your project. Partition walls and small spaces suit each other well. Often, when we think of partition walls, we think of small spaces as going hand-in-hand. Partition walls are a great way to divide a space without closing it in. They are also a great way to separate a large space. It has become quintessential to have an open floor plan… so when every room is opened up to another, how do we separate one area from the other? Of course this can be done in a number of ways, like with a detailed ceiling plan or changes in floor material, but another good way to do this is with partition walls. The foyer seen above is a great example that incorporates all of 3 these ways. This is another great example of a successful partition wall. It allows this house to be more open to the dining room, without having to completely tear out valuable walls for cabinet space. This partition wall opens up the center stair well. It opens up the stair well, so the user does not feel closed in, as well as, provides a fantastic feature for the room. This partition wall separates a back entry from a living space, and like the kitchen example above, it uses a half wall to for a bench and storage space. On to the bathroom. It is very common to use a partition wall to separate the shower space from the rest of the bathroom. We love how this one allows you to walk completely around it, and doesn’t go all the way to the ceiling. It adds a lot of good dimension to the space. There are so many useful places for a partition wall and so many ways they can look. Here are few more great examples. Wood beams are very popular at the moment. HGTV shows have boosted the popularity of the “rustic farmhouse” look, and wood beams are necessary to achieve that look. I’ve had a lot of experience in designing with beams – I’ve been a woodworker for thirty years myself, and I own a mill. I know personally how difficult they can be to install. Still, clients love them, and the effect they can have on a design, and the finished space, is great. 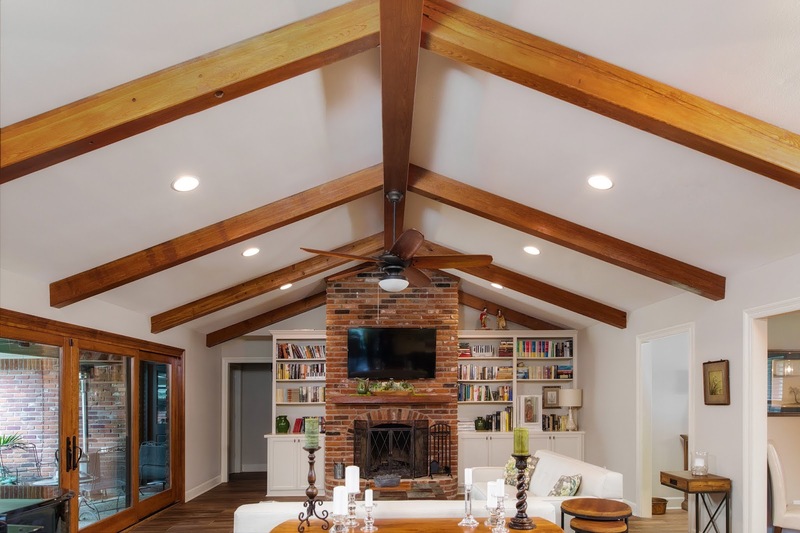 These are a couple of things to keep in mind, should your client ask for wood beams. Any wood beams that you add to a design should appear to be structural. 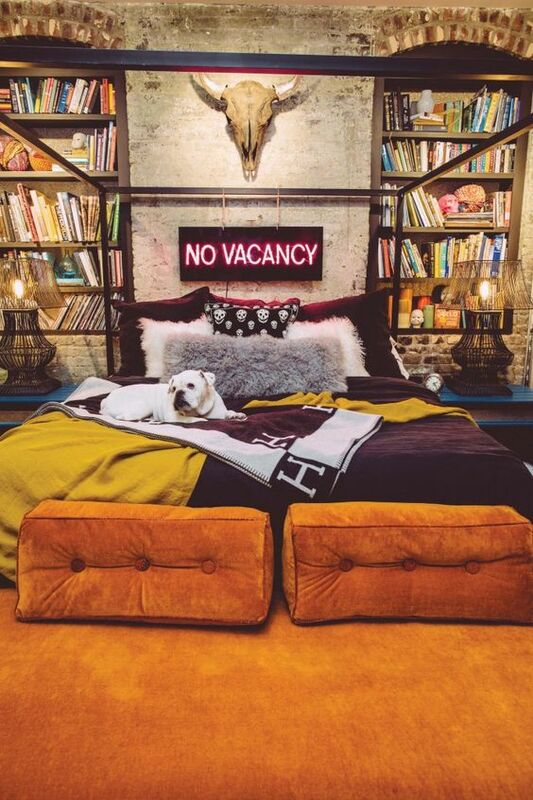 Not only is this in keeping with the rustic look, it’s also a more aesthetically pleasing look. The beams need to be spaced about 4 – 6 feet apart, in order to reproduce the structural look. I don’t like beams along the wall; I think the look is inauthentic. However, half beams can be made to look like they’re sitting on the wall and extending over the post. If a client insists on flanking beams, I would steer them towards that option. You want to ensure that the beams are proportional to the space. As a general rule-of-thumb, you want them to be taller than they are wide. However, if the space has a low ceiling, or if there simply isn’t room for the beam system your client wants, there is a compromise. If the house has a Cathedral peak, I would personally go with a 10” wide by 14” tall beam. Be careful not to overwhelm the space with too large of a beam. Adding beams, either during the build or after it is finished, makes this style more accessible. 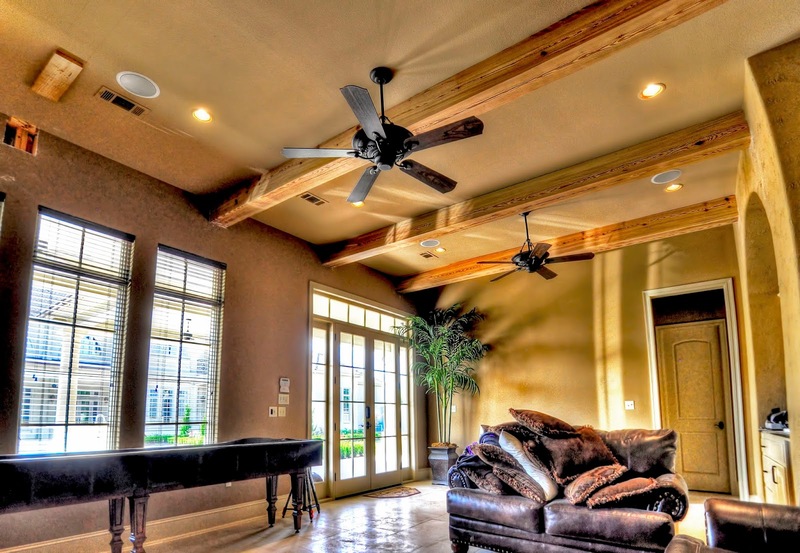 You have two options when it comes to wood beams – solid or engineered. Of the two options, solid beams require the most work. They need to be worked into the design from the beginning of the build, and there isn’t much opportunity to change the design once the framing has commenced. Special equipment – lifts, braces, etc. – is needed to install them. 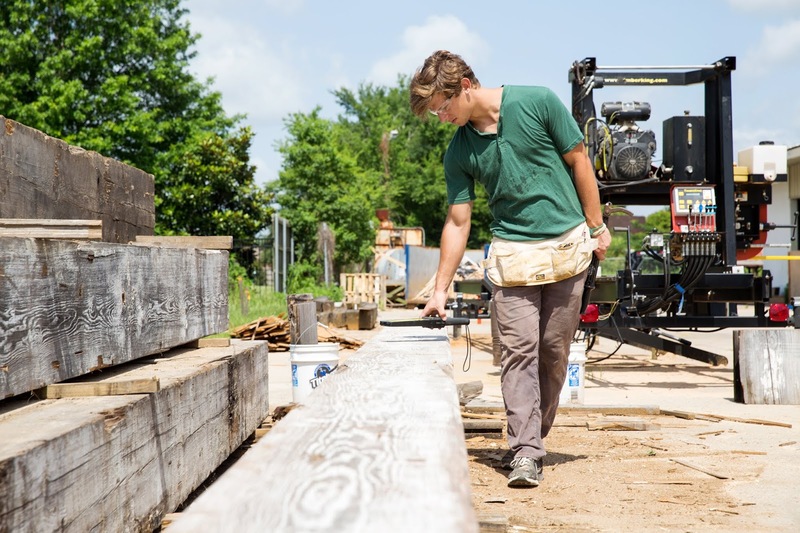 It’s difficult to get a permit for reclaimed wood beams in a structure. Most solid beams added today are cut from new wood, which is prone to warping and settling. It is also difficult to match solid beams. Years of aging cause changes in color and warping. However the authentic patina, as well as the unique history behind each beam, makes solid beams unique. The other option- engineered beams- is much less of a headache. Engineered beams are lighter and easier to install. Another consideration with designing wood beams is when in the process the beams will be added. Structural beam and post systems will need to be installed by the framing carpenter at the same time as framing materials. The benefit of engineered beams, like the ones we make at The Olde Mill, is that they can be added later, either after the home is built or at any stage in the renovation process. This gives you flexibility when it comes to planning your job’s timeline. Skylights are an effective way to bring natural light into a space in a interesting way. As well, they can make a big difference in making the space feel more open. The sky is endless, and including skylights makes your ceiling endless too. Skylights got a bad reputation in the 70s & 80s because of all the potential problems they had: leaking, sweating, rotting, cracking (just to name a few). But from the ashes we rise… a lot has been learned and skylights today are made better than ever. Many companies today are selling reputable and quality skylights. These skylights also come with a lot of technology we didn’t see in the 70s and 80s, like shading systems, rain censors, and venting units. Visually, you will find they are becoming very clean-lined and seamless. In general, there has been a movement (away from the 70s & 80s) to obscure the (literal) wall between the interior and exterior. More and more, we are bringing nature into the home, with plants, windows, and SKYLIGHTS. The more seam-less the skylight, the more obscure the exterior is from the interior! With all that in mind, here are a few skylights you won’t be able to live without. And then He said let there be SKY-light! 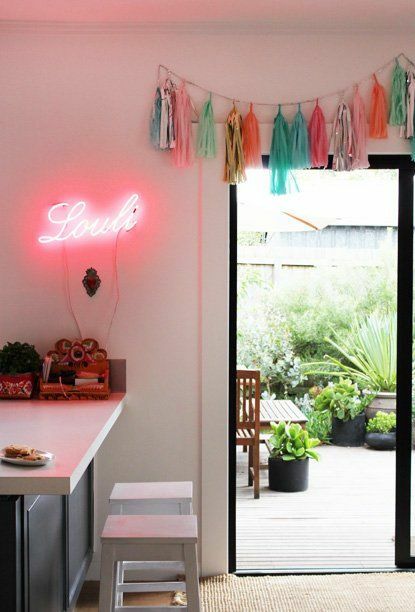 If you had asked us a year ago what would be the biggest decorating trends of 2018, neon lights would have been pretty far down the list. In fact, it wouldn’t have been on the list at all. The fixtures had been decreasing in popularity over the past decade, with more inexpensive LED lights replacing them above restaurants, bars, and businesses. But neon lights are having a big moment. 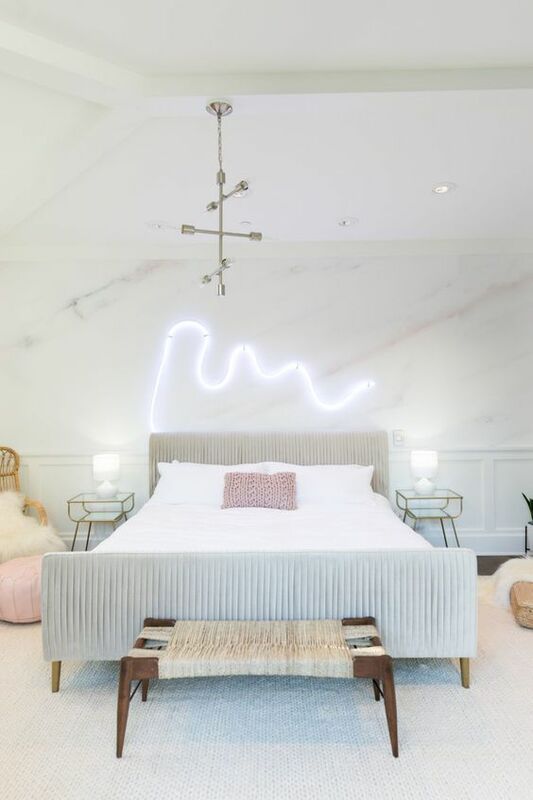 After an episode of Keeping Up with the Kardashians showed the huge neon sculpture above Kourtney Kardashian’s bed, the lights’ popularity has exploded. It’s easy to see the appeal of neon lights. They’re vibrant colors and whimsical nature make them a great addition to any room. 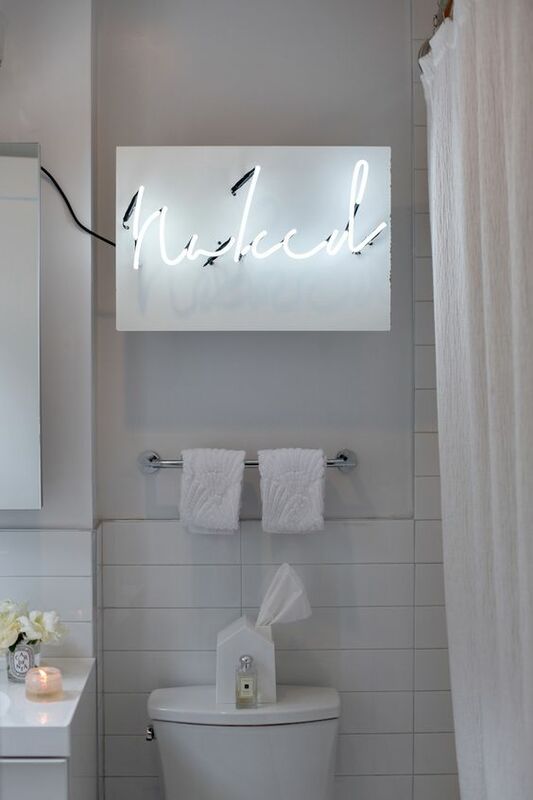 With the number of businesses producing these little lights rising every day, you’re sure to find a neon light that fits your budget and your style. Neons are always going to draw the eye. Their bright colors and whimsical configuration mean that other accessories or decorations in the room will play second fiddle. 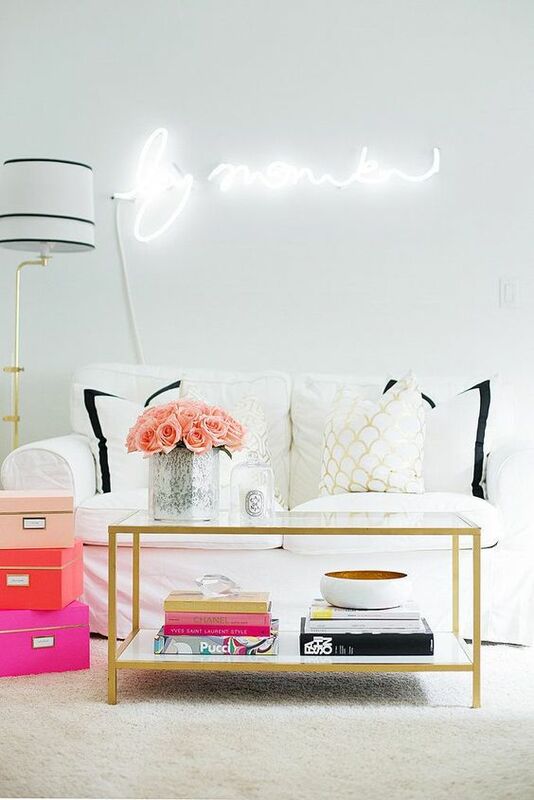 To keep your space harmonious, don’t put neons too close to anything with a busy print or pattern. Solid colors and natural materials are the best choices when it comes to displaying your fixture. 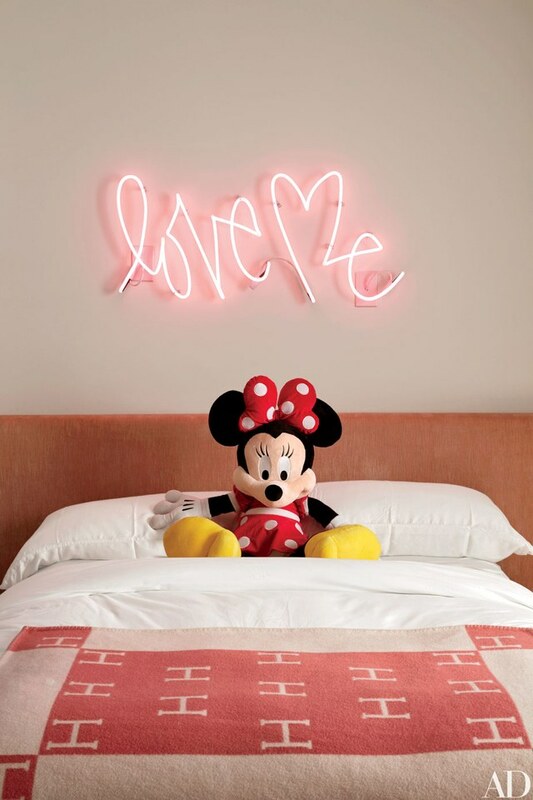 It is inevitable that guests will ask about your new neon sign. The vibrancy of the pieces make them great conversation starters. You need to be prepared to explain your choice, whether it be a phrase or an icon. Choose something that has a great story. Do you really like Walt Whitman quotes? Have you always wanted to open a cabana bar? Be prepared to explain your choices each and every time you have friends or family over. In the past 100 years, the only real advance in neon sign technology is the widening of the fixtures’ color palette. The original neon signs were only available in reddish orange (the color neon produces), but, now, there is a whole rainbow of colors at your disposal. White neon lights are popular, but you can also do yellow, magenta, chartreuse, and any colors in between.